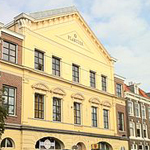 De Plantage (Plantation) is a green neighborhood in Amsterdam with a rich history. Because of the variety of interesting places, you can easily spend one or two days in this area. De Plantage is situated at the east end of the city. On Waterlooplein you can find Amsterdam’ biggest flea market ‘Waterloopleinmarkt’, best for second hand clothing and not far from the city center. This outdoor market looks like a large bazaar where you can buy new trendy t-shirts, but also vintage and retro stuff like military uniforms. In the 17th century Amsterdam was one of the fastest growing and wealthiest cities in Europe due to its overseas trade. The city council decided that a new neighborhood was necessary to provide accommodation for its growing number of inhabitants. This extension on an old swamp was finished in 1680, but the neighborhood was too large and many plots of land stayed unsold. Instead of building new houses, the decision was taken; citizens could purchase the plots and keep gardens. It became a green and spacious recreation area and it turned out to be a great success. De Plantage became a very popular neighborhood in the 19th century and as a result bars, theaters and dance halls opened their doors. Many wealthy Jewish citizens, actors and writers moved into this area and started to build new majestic houses. Not far from the ‘Waterlooplein’ you can visit the Hermitage Museum. This is the Dutch annex of the Hermitage Museum in Saint Petersburg and is located in a 17th century historical building on the banks of the Amstel River. The Hermitage museum offers changing exhibitions throughout the year. 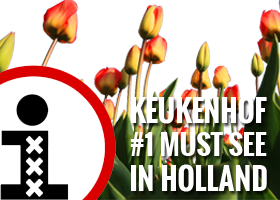 Nature lovers can enjoy the many species of trees, plants and flowers in the botanical garden, ‘Hortus Botanicus’. This is one of the oldest botanical gardens in the world with more than 6 000 different plants. Artis Royal Zoo is much more than a zoo. It is the oldest zoo in The Netherlands with a rich history and a beautiful park with old monuments, characteristic buildings and unusual gardens. And of course you can see more than 900 species of animals in Artis; like elephants, lions, gorillas, giraffes, seals, monkeys and a great butterfly garden. 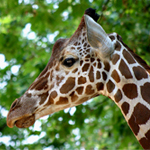 Many people visit the park not only to see the animals but also to have a picnic with family and friends. 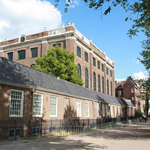 The ‘Tropenmuseum’ (Museum of the Tropics) is housed in one of Amsterdam’s most beautiful and largest historic buildings. This is one of Europe’s leading anthropological museums. The collection of the Tropenmuseum contains more than 300.000 exotic objects and historical photos from Asia, Oceania, Africa and Latin America. The ‘Oosterpark’, located right behind the ‘Tropenmuseum’, is one of the largest and greenest parks in Amsterdam. The park has wide open spaces good for picnics and is well kept and clean. 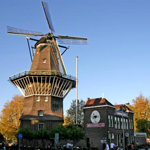 The Netherlands is a country of windmills and…..beer! ‘Brouwerij ‘t IJ’ (the IJ Brewery) is located next to the ‘De Gooyer’ windmill. This small brewery was opened by a former musician, Kaspar Peterson, in October 1985. It currently brews four seasonal beers and five standard beers. All the beers are certified organic. The pub in the brewery is open daily from 15:00 to 20:00 and has a large outdoor terrace. The brewery also offers tastings and guided tours. If you are planning to visit The Plantage area, don’t miss it!